Two titans of classic rock join together for an unforgettable tour that will delight fans! Chicago – The Band & The Doobie Brothers are heading to The Forum on Saturday 10th June 2017 as part of a trek that will see these iconic 70s bands doing what they do best! “The perfect summer line-up, playing dozens of the best-loved rockin’ pop classics. I’m happy to be hangin’ out with our ‘Doobie’ friends… a great band,” said Robert Lamm of Chicago in a prepared statement. 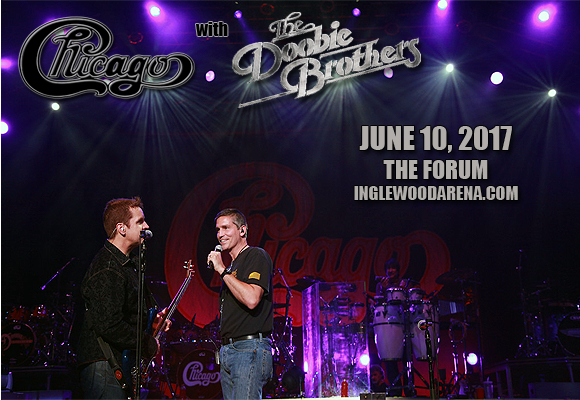 “We are so excited to once again be sharing the stage with our wonderful friends Chicago! They’re a great band, and musically we fit together very well,” added Tom Johnston of The Doobie Brothers. The Doobie Brothers are an American rock band that have sold over 40 million albums worldwide, and have been a part of the music industry for over fifty years, earning themselves four Grammy Awards along the way! They began in 1970 and, at the time, had a mainstream rock and roll sound that incorporated elements of folk, country and R&B. The band's sound diversified with the departure of lead singer Tom Johnson in 1975, incorporating a soul-influenced sound through their new lead singer, Michael McDonald, who fronted the band until their break-up in 1982. The band reformed in 1987, bringing back Johnson to front the group. They have constantly toured since 1993, occasionally with McDonald sitting in, usually as a special guest. The Doobie Brothers were inducted into the Vocal Group Hall of Fame in 2004, and their most recent release features some of country music's biggest superstars, including Blake Shelton, Zac Brown Band, Brad Paisley and Toby Keith.